A film about people born into conflict, sworn to be enemies, Palestinians and Israelis, who challenged their fate and joined together to say "enough." In a world torn by conflict--in a place where the idea of peace has been abandoned--an energy of determined optimism emerges. When someone is willing to disturb the status quo and stand for the dream of a free and secure world, who will stand with them? DISTURBING THE PEACE is a story of the human potential unleashed when we stop participating in a story that no longer serves us and, with the power of our convictions, take action to create new possibilities. DISTURBING THE PEACE follows former enemy combatants--Israeli soldiers from elite units and Palestinian fighters, many of whom served years in prison--who have joined together to challenge the status quo and say "enough." The film reveals their transformational journeys from soldiers committed to armed battle to nonviolent peace activists, leading to the creation of Combatants for Peace. While based in the Middle East, DISTURBING THE PEACE evokes universal themes relevant to us all and inspires us to become active participants in the creation of our world. "A tremendous achievement - a stirring and profound film that chronicles the noble efforts of Israelis and Palestinians to realize their common humanity, to break the horrendous cycle of violence and move toward peace. We, people of every nationality, need to see it, think about the individuals who expose themselves to us, and be drawn into the indispensable process of wrestling with our own vengefulness in order to transcend our lesser selves." "An inspiring story of dedicated individuals who could motivate genuine solutions for Israel/Palestine peace. Highly recommended." "Carefully measured...Inspiring, hopeful...although there is still a palpable sense of just how big a challenge remains. 4 stars." "Their stories are compelling - and persuasive...The transformations they describe are less like lightning bolts and more like dawning epiphanies." "A deeply-moving, powerful film with an inspiring message...The film offers us a glimmer of hope at time when the prospects for Israeli-Palestinian peace look so bleak. This is essential viewing for educators, activists, and anyone concerned about this tragic conflict." "The film is a space for listening, for trying to understand." "A very powerful film, especially those first-person accounts by former Israeli soldiers of the moment when they realized they were doing something morally indefensible, despite the propaganda they'd been subjected to. Also very powerful to see how caged the Israeli army is when there are peace demonstrators on both sides - an illuminating moment." "Highly Recommended...Outstanding...This review does not do justice to the visual impact of the film...An important film." "It sets a high precedent for the fest's new humanitarian award...Not only does it provide proof of previously thought unbelievable tales of peace, but it further humanizes everyone in the conflict." 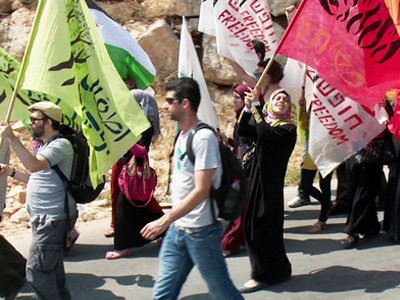 "Disturbing the Peace provides great insight into the conflicting perspectives between Israelis and Palestinians-and how peace will be realized...The film's message is one of hope." "A moving documentary...potent and earnest." "Disturbing the Peace is a rejoinder to pessimism, delivering a message of hope that lands with some success." "Fresh and thoughtful...Essential viewing for anyone wanting to understand the Israeli-Palestinian conflict from a human perspective, but also as a testament to the human capacity to forgive and the need for empathy." "Of the many films I've seen, this is one of the best. It presents both sides without equating them." "Offers hope that the Israeli-Palestinian conflict might come to an end in our lifetimes...Packs a powerful message." "The stories told in Disturbing the Peace are personal and hit you in both heart and mind." "A paean to nonviolent civil resistance...It should make people all along the spectrum from right to left uncomfortable...An important film." "Unique and poignant...Emphasizes the power of embracing peace and reconciliation." "Disturbing the Peace is the kind of movie we need at this moment." "Transcends borders, races, religion, and any other labels that are used to divide and conquer...Inspiring." "Reminds me that there are many conflicts happening the world and even in the darkest of circumstances, there is hope." "[A] substantive documentary about the mighty power of empathy, compassion, forgiveness, and nonviolence." "Sensitively crafted...The film skillfully explores the historical and emotional divide that the brave peacemakers (four Palestinian fighters and four Israeli soldiers) must bridge." "Courageous...A hopeful look at an unrelenting conflict...Use...in world studies, current events, modern Middle-Eastern history, and perhaps religious studies courses." A personal essay revealing the passionate debates over identity and generational change inside today's American Jewish community. 70 years ago Costa Rica abolished its army and committed itself to fostering a peaceful society. It has been reaping the benefits ever since. To kill or not to kill? For some the war is within. The story of activists who opposed the wars in Iraq and Afghanistan, including their lives, the tactics they used, and the historical context. John Pilger reveals the shifting morale and open rebellion of Western troops serving in Vietnam. John Pilger returns to the Middle East and questions why there has been no progress towards peace. "Offers a rueful assessment of the major challenges to ending the friction in the Middle East, while still holding out hope that the goal is not impossible. Recommended." "While seemingly vastly different, all protagonists show empathy when they manage to see past the enemy and recognize the humanity...A gripping documentary to watch. This movie fits in classes on Middle Eastern politics, peace movements, and a vast array of history and politics classes...Disturbing the Peace is a useful educational documentary that offers the viewer the opportunity to see a conflict from both sides, showing that none is only the hero or the villain...It is a hopeful look to a better, more peaceful future."